Widely understood to be essential to success in the workplace and modern life, digital literacy is beginning to emerge as a necessary component of curricula across the globe. As current undergraduates have never known a life without the internet, it’s only natural that universities should nurture their familiarity with technology, encouraging its use in teaching and learning. Instructors should also be prepared to offer guidance on what students aren’t as familiar with–turning their technical skills into skills for lifelong learning and employability. But where does one begin? Teaching digital literacy is about more than just integrating technology into lesson plans; it’s about using technology to understand and enhance modern communication, to locate oneself in digital space, to manage knowledge and experience in the Age of Information. 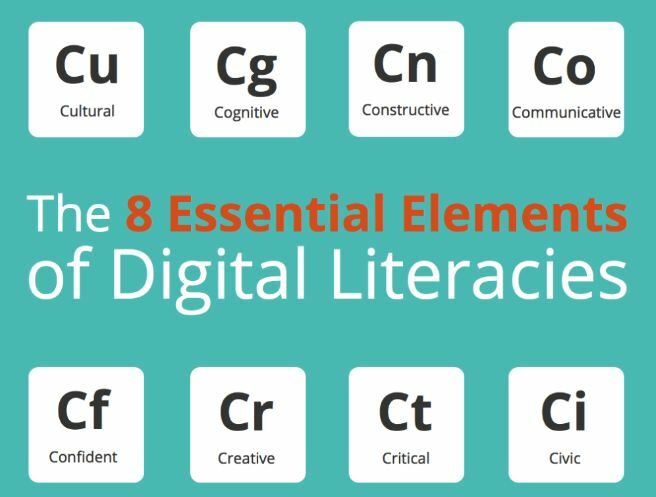 Digital literacy isn’t about knowing computers inside and out; it’s about using technology to change the way you think. If critical thinking skills haven’t yet become a part of your students’ digital citizenship, it’s time to rethink your teaching strategy. These are vague descriptions, as are most of the descriptions you’ll find of digital literacy in blog posts and journal articles online. What teachers need, more than a fancy synopsis of how digital publication affects the meaning of a text, is a practical and applicable guide to helping students think productively about the digital world. Below are the top do’s and don’ts we’ve come across–in research and in our own experience–when it comes to making students digitally literate. At some point, we’ve all been irked by the influence texting and Gchat have had on our students’ language use. We’ve said it is causing students to become less literate and to ignore proper English. But “digitalk” actually shows a complex understanding of language. Rather than destroying students’ grammar and spelling, research has proven that digitalk actually improves students’ linguistic competence. In other words, you have to understand the rules to break them. In addition, students develop an enhanced understanding of audience, purpose, and voice in their digital writing communities. In treating digitalk as wrong, rather than as an example of legitimate linguistic code-switching, you will fail to validate the digital literacy that students bring to your course. Don’t confuse the act of using a blog with the act of “blogging.” Blogging is an act of “connective writing” where the intention is to share, exchange, and discuss information. 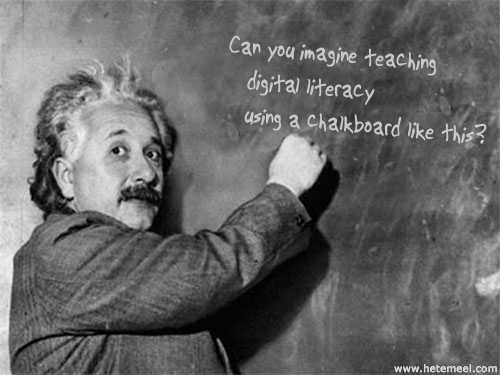 If the interaction isn’t there, you’re not doing much to serve your own digital literacy. Many of our colleagues feel that asking students to create PowerPoint presentations–or even using them in their own lectures–fulfills the requirements of teaching digital literacy. Not so. In the same way that some reductive writing pedagogies (five paragraphs of five sentences, for example) limit creativity, slideshows with a set number of slide, image, transition, and link requirements do little to support active learning. Just because a tool is listed on some new version of Bloom’s Taxonomy as “collaborative” or “evaluative” doesn’t mean we are using it in ways that actually manifest collaboration and evaluation. If you want to spruce up a planned lesson, be sure that it gives your content a lift as well. 1. Preach “originality in the rough. The same–or highly similar–information can now be found on countless websites, forums, blogs, and the like. The true test is to find a diamond in the rough: an original fact or thought that contributes something unique to the discussion. This is what students should be trained to look for. 2. Hold open discussions about plagiarism. Every teacher should hold a discussion of what plagiarism means in the Digital Age. What was once considered “copying” can now be regarded as repurposing in many cases. Refer to Kenneth Goldsmith’s Uncreative Writing for inspiration on this topic. 3. Help students develop a “nose” for quality. Ideally, someone with digital literacy should be able to rate the relevance and quality of a source almost instantaneously. Obvious markers include phrasing of titles, reputation of source, standard of web design, publication date, and keywords. 4. Train students to react skeptically. Especially when they read the phrase, “Research says…” or “A recent study revealed…” People are obsessed with data, and quick to believe dramatic figures when they see them. Be sure that whoever claims to back your facts is a credible source, and that the facts themselves are not skewed to manipulate your perspective. 5. Get used to multiple literacies, not just one. The Digital Age has brought us not a single new type of literacy but several literacies that overlap and define one another. New literacies include Layered Literacy, which describes the way that print and digital overlap, creating intertextuality; Transliteracy, or the ability to read and write across a wide variety of media formats; Electracy, which refers to the pedagogical skills necessary for new digital skills; and digital citizenship, which covers the role and rights of a person within the digital world. 6. Read past the first page of Google results. SEO controls a lot of what shows up on the first page. Most of us have the patience only to scan what shows up on the first page. Teach your students to delve deeper, search in different channels such as Scholar and News, and keep it going until information no longer seems relevant to the topic. 7. Use tools like Feedly and Twitter to filter the deluge of information. Managing the volume of information on the Internet is a huge task, and completely overwhelming without a filter. Encourage students to use Twitter and Feedly for news updates and customize the content to fit their subjects of interest. 8. Teach your students to use WordPress. Think of WordPress as a replacement for the cursive writing we once required in schools. It’s a way to formalize your writing and lend authority to your voice. And it demonstrates the basics of a rapidly growing medium. 9. Teach your students to write HTML. Coding is hitting schools hard, but the important thing is to cover the basics. Once students know the fundamentals of the language, they can easily make more advanced programming part of their continuing self-education. 10. Encourage interviews via e-mail and Skype. What’s better than asking Google a question? How about talking face-to-face with the person who wrote the article you’re reading? Well, face-to-grainy-face, perhaps, but still significantly more informative–and motivating–than citing a passage from a text. 11. Require students to create their own digital products. This is the best way for students to learn digital citizenship, hands down. 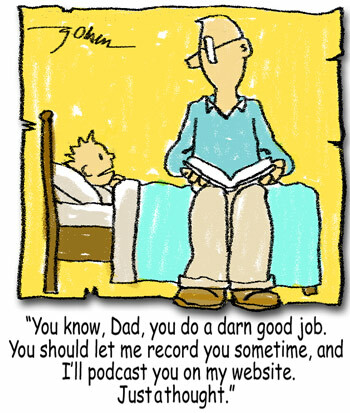 Learning-by-doing could not be more effective than it is in the digital sphere. Have your students create blogs, record videos, engineer new apps–the possibilities are endless, and the benefits just about as inumerable. 12. Be sure they evaluate two, if not three, competing sources before drawing a conclusion. The best research approaches a topic from as many angles as possible. If you’re crafting an argument, search for facts that may prove your theory wrong. If you’re looking for supporting evidence, be sure it comes from a diverse selection of sources. 13. Teach your students to understand scientific discourse. Unfortunately, most research papers are not written for the layman. But understand them the layman must. Your students need to be able to interpret scientific language in order to benefit from scientific research, as it will not always be summarized for them. Believe it or not, this is especially important in the Digital Age, as information consumers become more and more accustomed to receiving their news in 140-character Tweets and single-sentence Facebook updates. Part of digital literacy is knowing when the unabridged version is worth your time. Technology has fundamentally changed how writing is produced, delivered, and received. One of the goals of teaching digital writing is that students will increase their ability to produce a relevant, high-quality product, instead of just a standard academic paper. 15. Use digital resources for empowerment. Having a voice and a presence online can be more empowering than we think. As students form online identities and personas, help them visualize the scale of the impact they could make on various communities and the confidence they will gain from doing so. Just wanted to say, having read a number of your articles, that you are doing good work over there. Informative, relevant and interesting. I really think you have it on the “digitalk” stuff. We teachers do ourselves a real disservice by looking on that sort of thing as some kind of deficiency on the part of its users. We need to see it for what it is and treat it as a dialect, a social code for a certain context. Thanks for stating something that is very worth stating!! Saga, you’ve written a very informative article that is useful to teachers and students alike. Your article has stimulated some innovative ideas for my Research Methodology class that I teach for undergraduate students in health sciences. Thank you for the information and inspiration. Jeb, much appreciated! Ms. Cabrera, I agree that the point about “digitalk” is one of the most important. It’s simply a different discourse, like any other, and deserves to be taken as seriously. Uma, that is wonderful to hear–digital literacy is certainly an essential part of research methodology these days. Great work Sage. I enjoyed the article, read it two times and took some notes. even shared on my LinkedIn page. The article is great fro digital citizenship; it, however, does not include teaching fundamentals such as computational thinking, working memory and collaborative problem solving. It also could include teaching coding which is the basic fundamental behind almost all digital technologies. Concepts such as algorithms, programs, loops, conditionals, bugs/debugging, broadcasting and etc are essential in Thinking digital. Hi Jalal, I’m really glad you found the post useful. You’re right that more advanced forms of digital citizenship begin with mastery of the fundamentals. You’ve inspired us to put together a sequel to this post that addresses those basic skills! Thanks for reading. Thanks for inspiring me to be more confident in exploring the further usage of the digital learning approach for my students. I have started with simple things such as using multimedia in class presentations, digitalk in communicating, sharing and updating things with my students. And by going through your explanation, I could see there are so many more things that I can learn and further improve and use in my teaching activities – not to be outdated with the high speed of technology, as I understand that we teachers are always have to cope up and adjust to the nowadays learning process to be attractive to the students to smoothen the transfer of knowledge. Thank you for reading, Rilwan. Really glad you found the information useful!